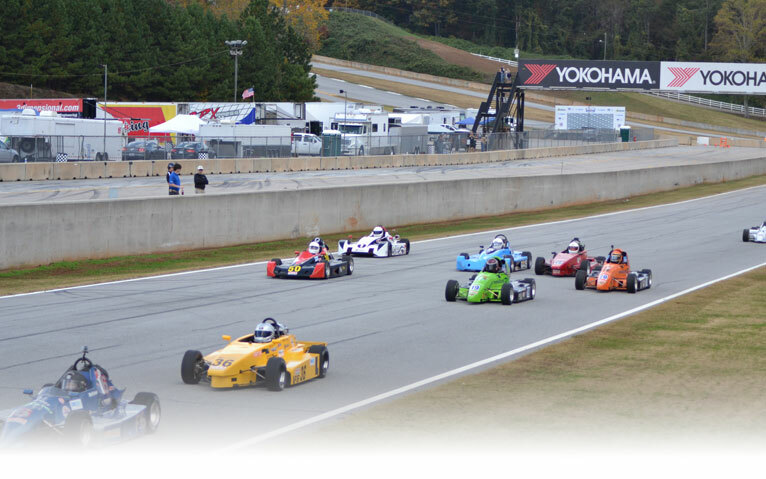 The Formula 600 Challenge series was developed to help promote an affordable open wheel formula car to showcase talent without large financial race budgets. The Formula 600 open wheel car uses a 600cc motorcycle engine and a 6 speed sequential transmission revving up to 15,000 rpm with speeds in excess of 140 mph. The sound of these cars is likened to a F1 car. There are no paid staffers and one hundred percent of all sponsorship monies and product goes directly to the drivers in our series mostly as a tow fund payment for each race. How affordable? A new car is roughly $30,000 (depending on options) and this is about ½ the price of a new Formula F that runs about the same lap times. The restrictions on the chassis/drivetrain keep the price affordable. The tow fund and series points help with your expenses. We race with Sports Car Club of America and usually have four double race weekends over the season with a finale in the fall for a total of five weekends about once a month. We usually run from the spring until the fall. We try to run at race tracks from Kansas east to Virginia and Wisconsin south to Atlanta. Check our event schedule for the nearest race and come visit with us in the paddock. Next up – do you have a SCCA driving license? If so, then proceed to #3. If not, then go here to start the licensing process - https://www.scca.com/pages/i-want-to-road-race Please note that you do not need to run a F600 for your driving school(s), rent the cheapest car like a Spec Miata to get you through the school. IF you really want to rent a F600 for your school (IF there is one nearby) then let us know. While you are going through the licensing process it is paramount that you become an educated consumer BEFORE you spend any serious money. You start by going to our forum (http://www.formula500.org/) registering, logging in and posting an introduction in the general discussion of the F600 area; include what part of the country that you live in. You want to meet the nearest F600 driver(s) so that you can start to help him with his F600 at least at the races that he runs AND between races IF he lives close enough. The goal is to gain hands-on knowledge so that you don’t make any avoidable mistakes which could be expensive. Over whatever timeframe that it takes to be comfortable with F600 technology, you will arrive at a point where you are ready to start driving. At this point, you may want to rent/test several different cars for the sake of comparison before choosing. One important thing to remember is that the cockpit can be modified to fit you – steering wheel, pedal positions, seat, padding and even intrusive bars can be moved – but try to find one that comes closest to fitting you, if possible, then modify. Of course, an enclosed trailer and good tow vehicle is a must. Formula 600 is the latest evolutionary step of the F440/500 class that first started back in 1984. The two stroke snowmobile drive-train is replaced with a stock 600cc Japanese motorcycle drive-train. There are now two alternative drive-trains for the F500 SCCA class.